The Lumia 950 XL and Lumia 950 - the very first high-end Microsoft-branded smartphones - can now be pre-ordered in the UK and Italy (and we assume that, pretty soon, customers in many other European markets will also be able to pre-order them). Both new Lumias are expected to ship "by December 3" in the UK, though folks in Italy should get them faster: by November 27. What about prices? Well, The Lumia 950 costs £449.99 in the UK (just as previously reported) and €599 in Italy. The Lumia 950 XL is obviously a bit more expensive: £529.99 in the UK, and €699 in Italy. Running Windows 10 out of the box, the Lumia 950 and Lumia 950 XL offer various common features, including Microsoft Continuum, 20 MP PureView rear cameras, 3 GB of RAM, and 32 GB of expandable storage space. The 950 sports a 5.2-inch Quad HD display and is powered by a six-core Snapdragon 808 processor, while the 950 XL comes with a 5.7-inch Quad HD screen, and has an octa-core Snapdragon 810 inside. In the US, the Lumia 950 will be offered by AT&T, as well as unlocked via Microsoft Store. As for the Lumia 950 XL, it looks like US customers will be able to buy it only unlocked, directly from Microsoft. I keep checking AT&T website as it says coming soon in the phone selection. 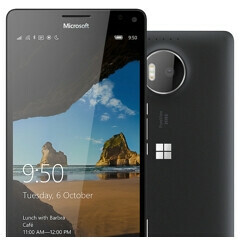 Finally a move that makes sense, offering lumias first in those places where you have a high market share. Come on Satya show us how you are better than Elop. Great news for both of you. We hope you enjoy your new phones. Next up, the dozen folks in the US. I kid. I kid. These are actually really great devices and would kill if they were on a different OS. Anyone who doesn't need the app market of iOS or Android will enjoy themselves. And what will be your third phone? I'd guess a lumia 640, they're really cheap and worth the money. On one hand I'm regretting getting the Note 5, on the other hand I was left with no choice here on Verizon.